China has overtaken the US as the top destination for foreign direct investment (FDI), for the first time since 2003. 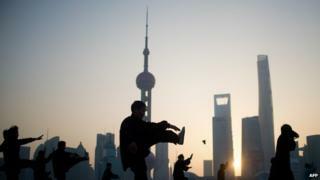 Last year, foreign firms invested $128bn (£84,8bn) in China, and $86bn in the US, according to the United Nations Conference of Trade and Development. The growth in China's foreign investment benefitted the services sector as manufacturing slowed. Globally, foreign investment fell by 8% to a total of $1.26tn last year. That was the second lowest level since the start of the financial crisis, partly due to the "fragility" of the global economy last year amid geopolitical risks. "FDI flows to developed countries dropped by 14% to an estimated $511bn, significantly affected by a large divestment in the United States," the report said. US investment fell by two-thirds last year, mainly due to US firm Verizon buying back $130bn worth of shares in a joint venture from Vodafone in the UK. The US is now third in the world for foreign investment, behind China and Hong Kong. Its foreign investment fell by 63% last year, compared to 2013. However, the UN agency said the strengthening of the US economy and the pick up in demand from lower oil prices would "favourably" affect foreign investment this year.